USE IT WELL: Nyabong (second left) hands over donation to a representative of fire victims of Uma Kulit whose 14-door longhouse was burnt last month as Ugak (fifth left) and others look on. 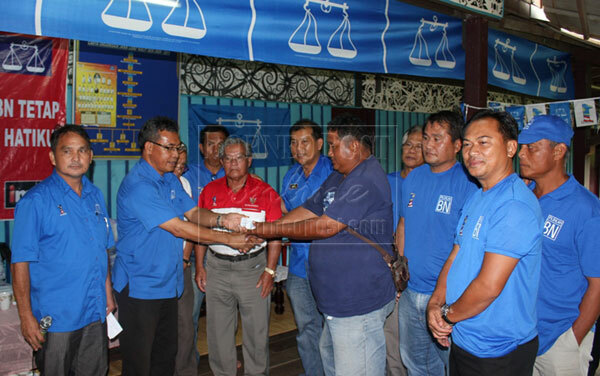 KUCHING: The Parti Rakyat Sarawak (PRS) nominated candidate for Hulu Rajang Wilson Ugak Kumbong is optimistic that Hulu Rajang will remain a Barisan Nasional (BN) stronghold if the overwhelming response he received during his walkabouts in the area over the past one year is anything to go by. The most recent one was the huge reception he received when officiating at a function at a Kenyah resettlement in Sg Asap whereby the people too pledged their support for the Barisan Nasional. Ugak added that the people had given a strong signal that they would not entertain the opposition’s presence in their midst including PKR candidate for Hulu Rajang Abun Sui, a Kenyah. Ugak was accompanied during the visit by a Political Secretary to the Chief Minister Wilson Nyabong Ijang to inspect the final preparation of his operations room at Uma Kelap in Sungai Asap. Ugak and Nyabong were satisfied with the preparations and declared that PRS was now ready to face the upcoming general election in Hulu Rajang. Last week, Ugak and Nyabong also inspected similar preparation in Belaga before attending a ‘meet-the-people session at Uma Menjawah. Ugak has been on the ground since he was nominated by his party to replace incumbent Datuk Billy Abit Joo, a five-term MP and a PRS vice-president. He has been visiting all the places in Hulu Rajang to get to know the people better and gather feedbacks on how to improve their livelihood. Ugak has set up his operations room in Kapit in 2010 to serve the people in Baleh and Belaga. Responding to a news report carried by a local tabloid yesterday Ugak said there was no rift or tussle between him and Abit.